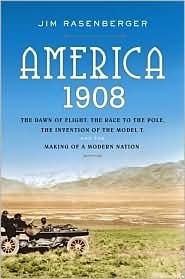 A breathtaking ride through the highs and lows of one spectacular, pivotal year in American history.As the earth turned toward the sun on the first morning of 1908, human flight remained, for most Americans, in the realm of myth and dream. But before the darkness fell on New Year's Eve at the end of the year, the Wright Brothers would be worldwide celebrities, heralded as the first people in all of human history to conquer the sky. It was the year Teddy Roosevelt sent the Great White Fleet on a voyage around the globe, Robert Peary began his courageous dash to the North Pole, six automobiles left Times Square on an epic twenty-thousand-mile race to Paris, and Henry Ford introduced an oddly shaped new automobile called the Model T.
It was a time of seemingly boundless innovation - everything was bigger, better, fast, and greater than ever before. In New York and Chicago, banks of high-speed elevators zipped through vertical shafts in the tallest buildings on earth. Pneumatic tubes whisked mail between far-flung post offices in minutes. Women cleaned their homes with amazing new devices called vacuums. And as American engineers cut a fifty-mile canal through the Isthmus of Panama, the very air buzzed with the imagined potential of new technology, including a "portable wireless telephone" that would someday allow people to talk while they walked.Meanwhile, the New York Giants battled the Chicago Cubs in one of the most thrilling seasons in baseball history, and a reluctant William Howard Taft was elected twenty-seventh president of the United States. By turns gripping and humorous, shocking and delightful, Jim Rasenberger's America, 1908 brings to life our nation as it was one hundred years ago, at a moment of delirious optimism and pride, a time when Americans believed that even the most intractable problems would soon be solved and that the future was bound to be better than the past. "What will the year 2008 bring us?" pondered the New York World on New Year's Day of 1908. "What marvels of development await the youth of tomorrow?" As Thomas Edison said later that year, "Anything, everything, is possible." The Ford Motor Company was founded by Henry Ford in 1903 and was the largest manufacturer of automobiles in the country until overtaken by General Motors in the 1920s. Wilbur and Orville Wright succeeded in the first manned heavier-than-air flight at Kitty Hawk NC in December 1903. William Howard Taft became president after Theodore Roosevelt but later became what he had really wanted to be, the Chief Justice of the Supreme Court. Thomas Edison was a prolific inventor whose inventions included the incandescent electric light bulb and the photograph.